The Canadian group - which recently played low-key UK shows under the name The Reflektors to promote fourth album Reflektor - will perform on the Friday evening of the Somerset event. The group broke the news to fans by posting a picture online featuring four show dates in June next year, including the Glastonbury gig. The message was written in chalk on a piece of material draped on a sofa and next to a sequinned cushion. 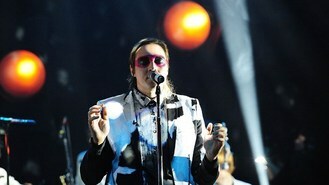 Frontman Win Butler had already hinted that the band may play the event with a less-than-subtle comment during a radio interview last month. Discussing plans to play summer festivals next year, he told DJ Jo Whiley: "G et your wellies ready."